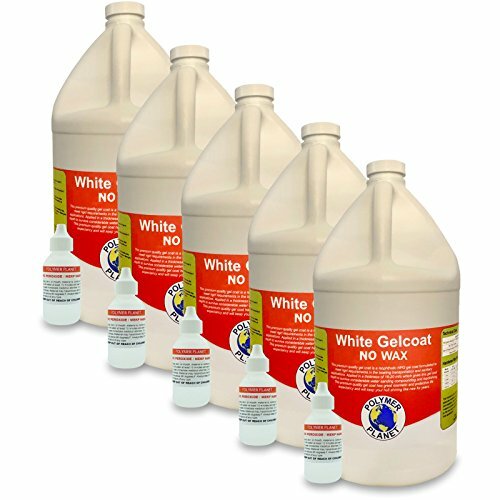 10G White Gelcoat No Wax and Hardener kit/UV Protection Fiberglass Boat Polyester with 5 x 2oz bottles equaling 10 ounces of MEKp-925. White Gel Coat to be used over fiberglass surfaces. This product is designed to cure to a tack-free finish. Sanding is required between coats where applicable. Features: Contains Hardener included Approximate Coverage per Gallon: 75 sq ft @ 20 mils Polyester Gel-Coat White With No Wax One Gallon Iso Polyester base. UV stabilized for durable weather properties. Use no less than 1/2 % MEKP, no more than 2% MEKP. Mix thoroughly for 2 minutes. Pot life is approximately 15-25 minutes at 77 degrees Fahrenheit. Complete cure is approximately 45 minutes to 4 hours. Do not use 60 degrees Fahrenheit. Clean surface and wipe clean with a dry rag. Apply with a Roller or Brush or cup gun application. Apply approximately 20 mils, approximately the thickness of a dime, of gel coat. Covers approximately 20 sq. ft. per quart, or 80 sq. ft. per gallon. May add up to 4 % pigment, normally 1oz. per quart, or 4oz. per gallon by volume. May be thinned with Styrene, adding no more than 10% by volume. Clean up with Acetone. View More In Lubricants and Oils.